In modern America, olive oil is something that is not given much thought or attention. It is occasionally used while cooking, but many people only encounter it while dining at an Italian restaurant when the waiter makes some available for dipping bread. All in all, it is not important in day-to-day life and we could readily do without it. However, in biblical times, this was not the case. In fact, the opposite was true. Olive oil was something that was used everyday in every house for a variety of imporant purposes. It was used for cooking as it is today, but also much more. Olive oil was used as a base for purfume (Esth. 2:12) or used to anoint someone's head to show them honor (1 Sam. 16:13, Luke 7:46). It was used as fuel in clay lamps to provide light (Matt. 25:3-4) even in a holy place such as the Tabernacle (Exod. 27:20). It was used in sacrifices (Exod. 29:40) and for medicinal purposes (Luke 10:34). The reason it became so important was not only because it was so versatile, but also because it was readily abundant in the Mediterranean basin where olive trees flourish. But the question arises, how was this vital product produced? One common process used in antiquity is described below. For our "picture of the week" we will actually be focusing our attention on three photographs because they complement each other so well. They all come from Volume 13 of the revised and expanded version of the Pictorial Library of Bible Lands, which focuses on Cyprus and Crete. This volume is an entirely new addition to the collection. The previous version of the PLBL had no pictures of either island. 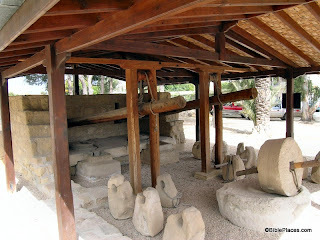 The first photo is entitled "Olive Press at Palaipaphos." (Click on the photo for a higher resolution.) 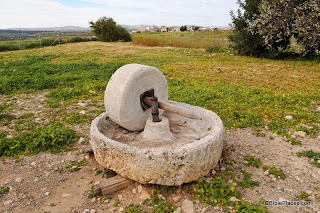 After the olives had been harvested, this type of press was used to break the olives up and prepare them to be squeezed by a second type of press. The olives would be placed in the bottom of the basin and the round stone would be rolled over them. The second and third photos show the type of press used in the second stage of the process. The second photo is entitled "Olive Press at Larnaca Museum," and the third, "Idalion Olive Press Factory." 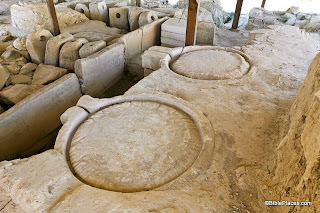 The top picture is a reconstruction of an olive press at a museum in Cyprus and the bottom shows the archaeological remains of the same type of press at the site of Idalion. They both are of the same type of press but are photographed from opposite angles: the round circles in the foreground of the bottom picture are barely visible in the background of the top picture. Placing the pictures side by side, you can get a good idea of how this type of press worked. After the olives had been broken up, they were placed in flat, circular baskets and laid on top of the stone circles. Several baskets would be stacked together. The stack would then be pressed using the large wooden beams shown in the top picture. The pressure on the beams would come from the stone weights which can been seen in both of these pictures: the standing stones with holes drilled through their top section. These stones would be tied onto the beam pulling it down and placing pressure on the baskets and the olives, forcing the oil to ooze out. The oil would then drip down onto the stone bench and would be caught by the circular channel which had been cut into the bench. Within the channel, the oil would be funneled into a spout where it would pour into a basin or vessel. From there the oil would be taken and used for a variety of purposes. These and other photos of Cyprus are included in Volume 13 of the Pictorial Library of Bible Lands and can be purchased here. More information on olives and olive trees can be found on the BiblePlaces website here and at the Life in the Holy Land website here.